Senators Offer Competing Views Of Sotomayor John Cornyn, a Texas Republican, questions the Supreme Court nominee's impartiality in applying the law, while New York Democrat Charles Schumer calls such lines of attack groundless. Judge Sonia Sotomayor, President Obama's nominee for the Supreme Court, is expected to begin making courtesy visits next week to Senate leaders and members of the Judiciary Committee who will conduct hearings on her nomination. Judge Sonia Sotomayor is expected to begin making courtesy visits next week to Senate leaders and members of the Judiciary Committee who will conduct hearings on her nomination to the Supreme Court. NPR talked with two committee members from both sides of the aisle — Sens. Charles Schumer and John Cornyn — about where they expect the discussion to go. Cornyn, a Republican from Texas, has signaled he wants to press Sotomayor on a comment she made in 2005 that the court of appeals is where policy is made. 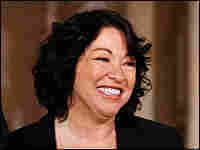 Sotomayor said at the time, "We don't make law, I know. I'm not promoting it, I'm not advocating it." Cornyn calls the comment "troubling." Schumer, a Democrat from New York who will sponsor Sotomayor before the committee and shepherd her on her visits with other senators, insists that it needs to be considered in the context in which it was made. Making Law, Or Interpreting It? "The core question for members of the federal judiciary is how they see their role," Cornyn tells NPR's Melissa Block. "Do they see their role as another branch of the legislature, but one that happens not to stand for election — and a license, really, to impose their personal views and agenda on the American people, under the guise of interpreting the law and the Constitution?" 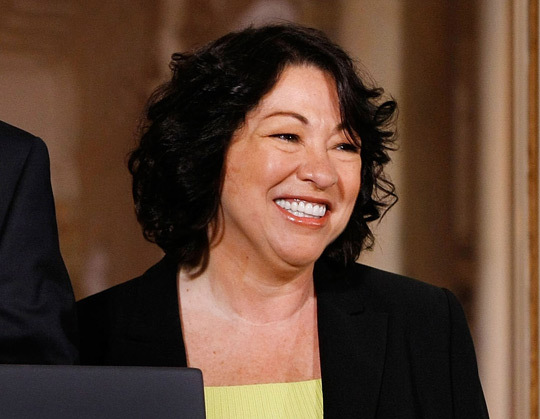 At the time she made the remark, Sotomayor also said, "The court of appeals is where, before the Supreme Court makes the final decision, the law is percolating — it's interpretation, it's application." Cornyn, a former Texas Supreme Court justice, says he disagrees with the idea that federal appeals judges look to how the law is developing so they can apply it to a broad class of cases. "It is the role of the highest court of the land — the United States Supreme Court — to say what the law is, and then it's the obligation of the lower courts to apply it," Cornyn says. "Courts of appeals are what I would call an error correction court. ... I think it is incorrect to say that their role is as a policymaker. It's up to the Supreme Court to make the ultimate decision." Cornyn also says he felt Sotomayor was backtracking when she cracked a joke about judges not making law. "It bothers me, actually, that once she realized she was on tape — that she began to joke about it and chuckle and sort of backtrack," Cornyn says. "I'm not going to prejudge her on this, but it certainly is something I intend to ask her about." Meanwhile, Schumer says Republicans opposed to Sotomayor have almost "nothing to hang their hats on." "She knew they were on tape all along," Schumer says. "What happens here is what the right wing often does: They will take half of the tape, show it, put it on YouTube and create an uproar, and then the person who said, 'What about the other half?' is on the defensive. We're not going to let that happen. We're not going to let it go unanswered. ... We're going to show the whole context of what she talked about and the tape itself." 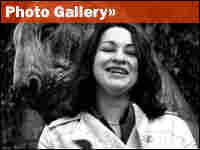 Another issue causing some uproar among conservatives is a speech Sotomayor gave at Berkeley in 2001, in which she said: "I would hope that a wise Latina woman with the richness of her experiences would more often than not reach a better conclusion than a white male who hasn't lived that life." Cornyn says he doesn't know what she means. "I think the problem is that when judges begin to focus on themselves rather than the role at hand — which is to interpret the law — they start to get in trouble," he says. Schumer disputes Cornyn's concern. "Rule of law has to come first, obviously. No matter what your personal background, if you're a judge, your job is to apply the rule of law," he says. "Obviously, within that context, our backgrounds influence us. You can't avoid it if you're a human being. I don't think any American wants nine people on the Supreme Court, all of whom have ice water in their veins." A Confirmation By Aug. 7? President Obama has said he wants a vote on this nominee by Aug. 7, before Congress goes into recess. Republicans say they don't want to be rushed. Schumer says that nearly 70 days should be enough time for the Republicans. He notes that Ruth Bader Ginsburg was confirmed in 50 days and John Roberts in 70 days. "The Republicans shouldn't be rushed and should have ample opportunity to question Judge Sotomayor, both privately and at hearings," Schumer says. He adds, "Where there is a will to do that, there is a way, and certainly they have every right and should do a thorough examination of her record. I don't see why that can't be done before Aug. 7." Schumer says Sotomayor is moderate on issues such as business and crime and says she has a strong, persuasive personality. He says he doesn't expect her to tip the balance on the court: She's neither more nor less liberal than Justice Souter, whom she would replace. "There are probably a few issues [where] she's more liberal than Justice Souter," Schumer says. "There are probably a few issues where she's less liberal. She's probably in about the same place overall." He adds: "If you're looking for someone who is going to be able to create a working majority in a more moderate direction, she's probably a good person to do that because of the strength of her personality and her ability to get along with people of every viewpoint."